It's the start of the week folks! I hope you have great plans to make this a wonderful and productive week. I am having a busy week and I am hoping I can get everything done that I hope to do! Y'all may or may not remember how I made reading at least one book a month one of my new years resolutions. I thought to keep me accountable I would start doing monthly book recaps to share what I have been reading. You can shop the books I have been loving by clicking on the picture above the description. I decided to also add in a few podcasts I have been loving this month. I just got hooked on podcasts about a week ago so there isn't a ton to share in this blog post, but hopefully next month I will have more to share. I have become kind of obsessed with plugging in my earbuds and listening to a podcast while I walk the neighborhood, or listening to one to and from work. It is so easy to just pull up the podcast app on the Iphone and search whatever you want! There are a billion gazillion podcasts on every topic imaginable so I am sure you will find a few you love too! 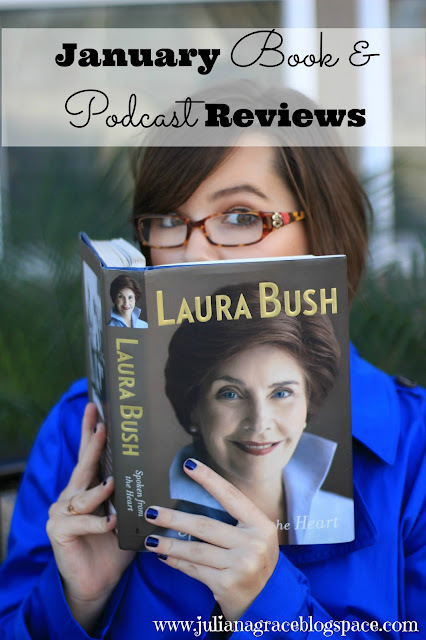 Okay y'all probably know from this blog post that I am obsessed with Laura Bush. She is so elegant and classy yet so passionate and educated. She was one of the classiest first lady's in my opinion. After reading her book about her life I can say I only respect her more. She handled so many situations no one knows about with such grace and has struggled a lot through her life with many different catastrophic events. Laura and her husband are still so in love and have so much respect for each other which I admire. I recommend this book to just about anyone. It is a larger book but isn't too hard to read. Ugh. Y'all. I really wanted to like this book but I just couldn't. It is kind of cool how the story is told backwards and you don't really know anything about the story or characters until the very end, but I found it so hard to hold on because of that. I spent the entire book feeling a little lost like I couldn't quite picture these characters (which again is kind of the point). I don't know if I would recommend it or not. It definitely wasn't my favorite but is a quick read if you are looking for one. Teach 4 the Heart- I have listened to a few of the podcasts from this series and as someone who aspires to be a teacher, they are extremely encouraging and helpful. The lady who does them is a Christian and I love to hear what she has to say about teaching with a Godly influence. She has covered so many topics I couldn't possibly listen to them all. They are quick, cute, and I love them. The Smart Creative Women Podcast by Monica Lee is great! I only listened to her podcast where she interviewed Ashley from Ashley Brooke Designs, and loved it. I love hearing other peoples stories and how they got started doing what they're doing. Ashley Brooke Designs is such a cute brand and Ashley has such a bubbly personality. 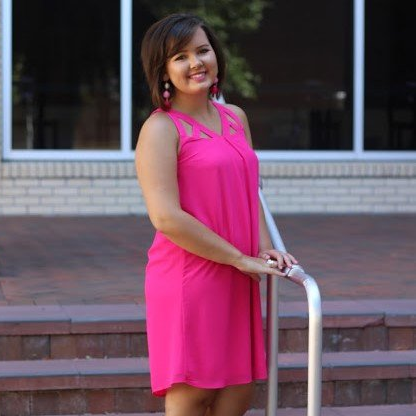 Her story shows that God has a path paved for everyone, and it may not be what you planned. I hope this post was interesting and you found some new things to read and listen too! Have a great rest of your Monday! Talk to you on Wednesday!